The most used nitrogen fixer in my food forest? Amorpha fruticosa. There are myriad reasons why: First and foremost, because it is easy to grow from seed. No scarification. No hot water or acid baths. It doesn’t even need stratification. But it grows. I planted a small handful of seed this spring, and I couldn’t even get around to potting up all the sprouts. Thankfully they didn’t all come up at once, giving me a larger span of time for transplanting. For such convenience, there is hardly compromise in quality. The USDA puts Amorpha fruticosa in the “medium” nitrogen fixer category, meaning it has 85-160 lbs per acre nitrogen fixing potential. This is very good for a native. 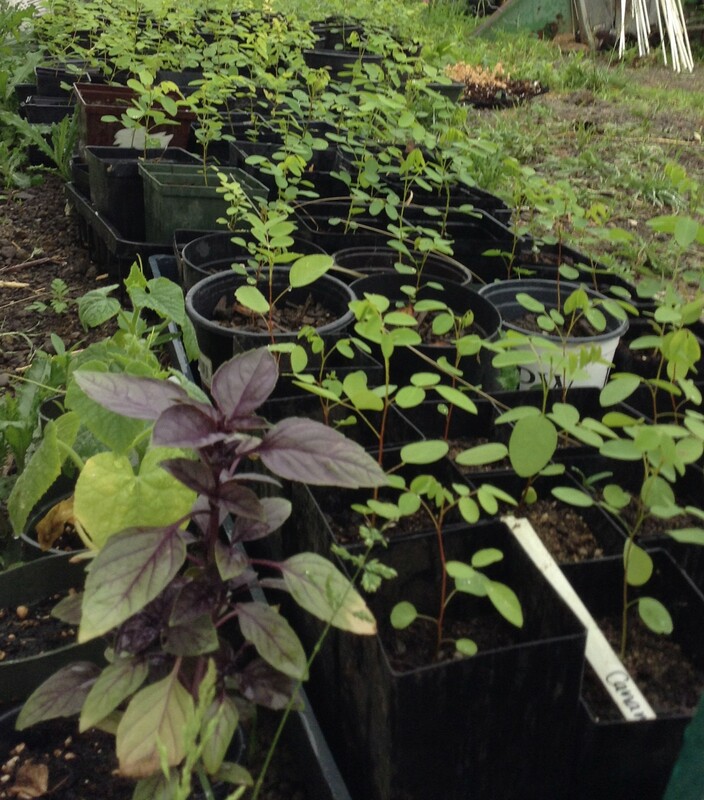 Being native, my seedlings found the right bacterial clients without any inoculation. For anyone not in its native range, it would be wise to inoculate to be sure you have them. I started finding nodules within eight months from planting the seeds. I imagine having or not having the bacteria would explain why some people think of this plant as slow growing. My established plants can grow as much as six feet from the ground up in one year. In their first year from seed, the fastest growing plants grew to just under three feet. Even in its native range the ground might not have the right bacteria. So if your plants grow much slower, perhaps consider getting some inoculant. A three year old A. fruticosa. The taller branch in the middle is the last three years growth. This fourth year it sent up the branches you see at the base, most of which were just under six foot tall by frost. Such fast growth doesn’t equate to a huge plant. It only grows to a maximum of 12 feet. Most people cite 6-10 feet as a more average height. But again, maximum benefit will be achieved from coppicing. So it shouldn’t ever get over 6 ft, right? It has no complaints being coppiced either. 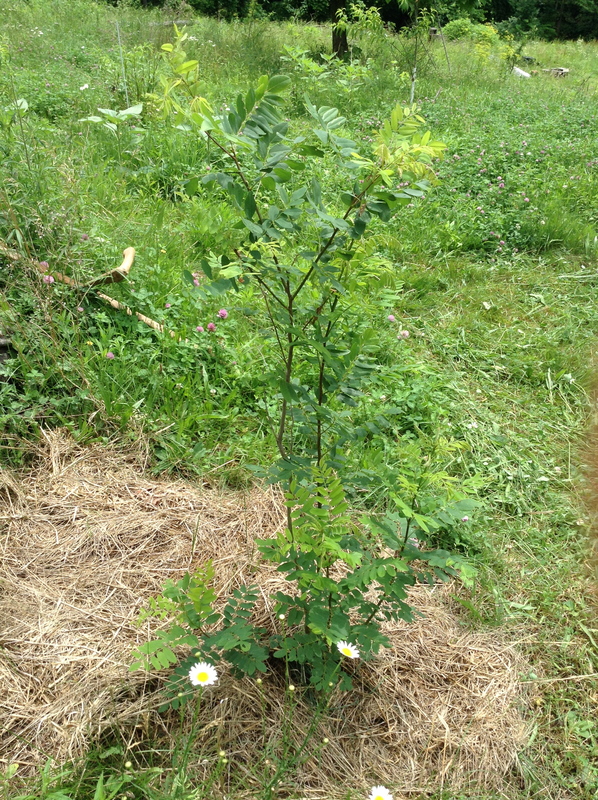 An experiment in the southeast US was able to coppice the plant four times a year. This management conveniently keeps the plant from setting seed, from which it propagates very well, as I mentioned. I plan to coppice mine just once a year, in late May. This is right before the flowers bloom so it doesn’t make seed, and makes for the best mulch material, since flowering time for a plant is when the most nutrients are active in its upper parts. If you want to keep the above ground growth, such as for letting the plant establish, I have been successful just popping off the blossoms by hand, since the plant doesn’t rebloom. I wouldn’t pluck them too early though, as the flowers are really very beautiful. On top of that, I have a love affair with healthy legume foliage. So between that, the flowers, and all the uses, there’s no wonder why I can’t get enough of it.